The Federal Communications Commission (FCC) will vote to repeal the agency’s net neutrality rule on Thursday, much to the dismay of Silicon Valley and Democrats and to the cheer of conservatives. The FCC will vote on Chairman Ajit Pai’s “Restoring Internet Freedom Order” on Thursday, which would repeal the FCC’s 2015 net neutrality rule, which regulated the internet as a public monopoly. Net neutrality proponents argued that the FCC needs net neutrality to prevent ISPs from unfairly blocking, throttling, or preferring some content, while conservatives argued that net neutrality would diminish the freedom of the internet. The FCC and Breitbart News’s Allum Bokhari explained that under net neutrality, content providers such as Facebook, Google, and Twitter serve as a greater threat to internet censorship compared to ISPs. Democrats and Silicon Valley companies argued that content providers cannot compete on an even playing field without net neutrality. On Monday Pai and the Federal Trade Commission (FTC) agreed to share the responsibility to police unfair ISP practices regarding unfair or deceptive practices to block, throttle, or promote web content. FCC Chairman Pai said in a recent speech that repealing net neutrality would restore the internet as a free and open platform. “So when you get past the wild accusations, fearmongering, and hysteria, here’s the boring bottom line: the plan to restore Internet freedom would return us to the light touch, market-based approach under which the Internet thrived. 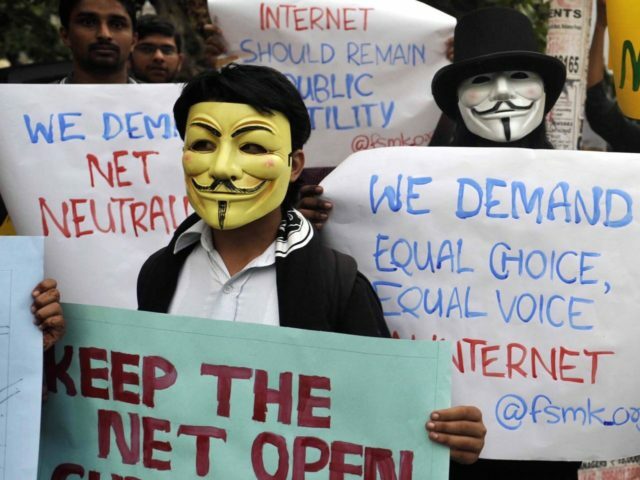 And that’s why I am asking my colleagues to vote for it on December 14,” Pai concluded.